Chances are you have already seen Dylan Blanchard perform. 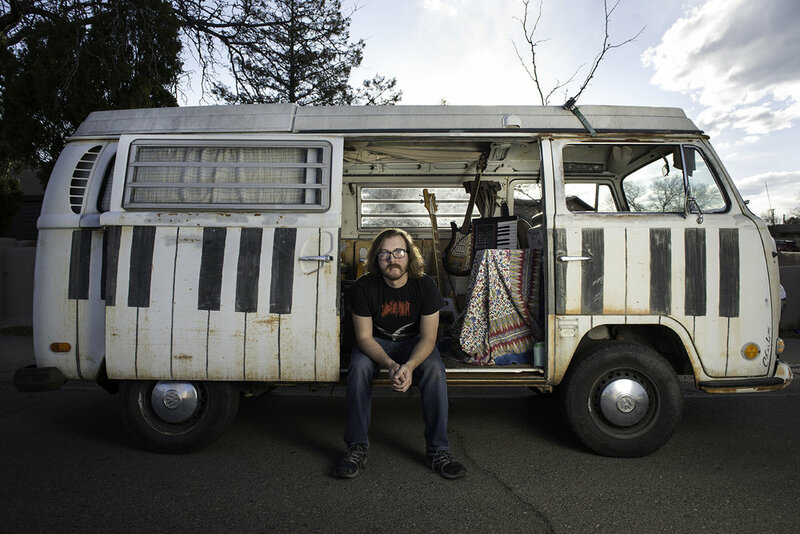 A multi-instrumentalist, current Meow Wolf artist and College of Santa Fe graduate, Dylan has lent his talent as a collaborator to numerous projects over his 17 plus years as a sideman and creative contributor. Most recently he joined Matron Records' Future Scars on keys, joined local indie-rock outfit Ten Ten Division on bass and contributed to garage-pop favorites Treemotel, with more distant contributions with Austin's Tristero (drums), Santa Fe's Babelshack (bass), Danny Whitecotton (drums, keyboards) and the infamous folk/rock orchestra Apple Miner Colony (drums). Now he steps to the front to lead his own project with his forthcoming 7" release, Ghost In Arroyo Hondo (Just One of Many), out on Matron Records on July 5th. Short but sweet, this two-track debut marks the first time since college that Dylan went into the studio to create something entirely his own and his years of backing up other musicians is evident it the release's clarity and dynamics. Contrasting styles, timbres, and influences all come together to create a sound that is both catchy and dissonant, energetic and dark, joyful and sad. The result is a taste of what will be more to come.